Punk Rock Big Year: I would drive 600 miles. Each way actually (FREE art). I would drive 600 miles. Each way actually (FREE art). What's in a "Like"? Possible funding for this documentary, that's what. The more Likes I have, the more interest there will be in giving us funding to do some of the things we need to do to get the best footage for this documentary. Please my Facebook page onto one (or more) of your friends and have them Like it. Let's see how many we can get to before my road trip this weekend. Over 600km each way for one target bird. It'll be worth the trip though. 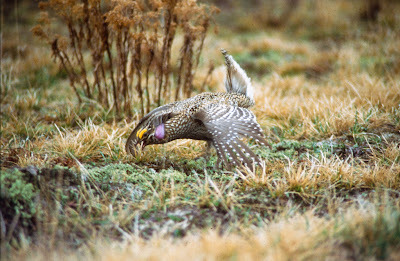 Sharp-tailed Grouse by USFWF Pacific. What's the incentive? Free art. As I've mentioned many times before, my wife is an extremely talented illustrator. You can view her work on her Etsy store, affectionately called Thrasher & Wren. The contest winner will get a free signed and numbered limited edition print from Thrasher & Wren. Any print you like. All you have to do is get a friend(s) to like Punk Rock Big Year on Facebook. Just e-mail me a link to your Facebook profile and a link to the person(s) you persuaded to like my page to punkrockbigyear AT gmail DOT com with Punk Rock Big Year FREE ART as the subject. The person that gets the most people to Like my page, wins the free print. Contest closes April 29th. That gives you 18 days! IMPORTANT NOTE: Much like bird sightings, this contest will have to be done on the honour system. Please only e-mail me with the people you got to Like the FB page after April 12, 2011. Early punk gets the bird. Bird 100! (We love nature). An Eider, I already have.